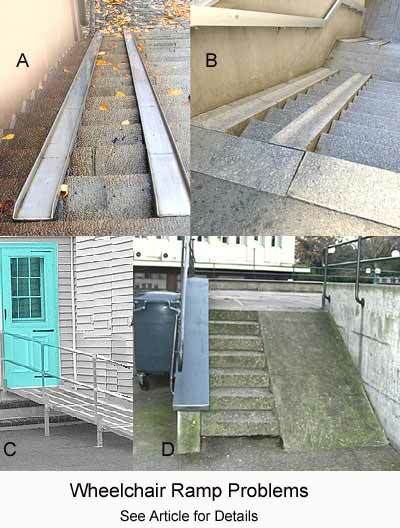 Wheelchair ramps offer wheelchair users freedom if constructed properly. But as can be seen in the photo below, some wheelchair ramps are difficult to use or even dangerous. This article offers several hints and tips about what to look for when selecting a wheelchair ramp. It is not a 'how to build a wheelchair ramp guide' and does not discuss building specifications or requirements. If you are considering building a ramp, we strongly encourage you to familiarize yourself with wheelchair ramp design plans and local building requirements. Some resources are offered below. Portable wheelchair ramps (usually for vehicles or small obstacles such as doorway thresholds). "I have designed ramps for over 3,000 people and the majority of them are surprised to learn that the ramp has to be longer than they expected. Some of them believed they really could put a piece of plywood over their existing steps and have a usable ramp. In my experience, people do not have the information needed to know how long their ramp should be. They understandably want to save money and space, and some have installed ramps that were too steep. They learned the hardway that too steep a ramp is no help at all". Degree of incline: As can be seen from the quote above, the most important factor for the wheelchair ramp is how steep it will be. For a permanent wheelchair ramp for public access it is usually best to use the lowest slope possible, which means, build the longest wheelchair ramp that you have space for. Why? A steep wheelchair ramp is difficult to climb and can be very dangerous because of the risk of tipping backwards. The absolute maximum acceptable incline for a wheelchair ramp intended for public access is 1:12. 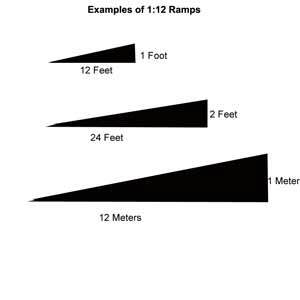 This means that for every 1 foot in height the ramp must be at least 12 feet long or more (or for 2 feet in height the ramp must be at least 24 feet long, or for 1 meter in height it must be at least 12 meters long. See drawing to the right) and 1:18 is often recommended for the elderly. Even that will be too steep for some. In very wet or icy climates, less steep wheelchair ramps and rougher surfaces may be required to prevent wheel slippage. The ramps A, B and D in the photo below are much too steep to be of use as wheelchair ramps. If the wheelchair ramp is for your personal use, try a few wheelchair ramps and find one which you are comfortable with. Then calculate the steepness of the wheelchair ramp by measuring the difference in height from top to bottom of the ramp and then measure the length of the ramp. For example, if you are most comfortable with a ramp that is three feet high and is 60 feet long, then the wheelchair ramp you need will have an incline of 3:60 or 1:20. If the height of your ramp must be 2 feet, you will need a ramp 2 x 20 = 40 feet long. Landings: flat surfaces or level landings are necessary at the bottom and top of the wheelchair ramp. A landing at the top will allow the wheelchair user to open the door at the top of the wheelchair ramp. If there is no level landing at the top, it will be nearly impossible for the user to open the door. A landing at the bottom may be important for the user to stop the wheelchair before making a turn so they don’t end up in the bushes. If the length of the ramp is very long, include level resting platforms in the middle so that users may take a break if they get tired. In the photo, ramp C has no level landing at the top. It will be nearly impossible for a wheelchair user to open the door unassisted. Transition to Landing: Usually it is necessary to provide a beveled (or gradual) transition from the wheelchair ramp to the landing. This is particularly important at the bottom of the ramp. Wheelchairs are designed so that most of the weight rests on the large rear wheels. But when going downhill, the weight is transitioned to the small caster wheels in the front, which is very unstable. Without a transition at the bottom of the ramp, when the front wheels hit the landing, the wheelchair may come to a sudden stop and the wheelchair user can be thrown forward to the ground. Alternatively, a ramp with no transition to landing at the bottom of the ramp, may have a 'lip', that is, the ramp may be raised from the ground. This may be an uncomfortable bump for the wheelchair user or even a dangerous tripping obstacle for a caregiver or other unsuspecting pedestrian. It is always recommended to have a smooth transition to landing at the bottom and the top of the ramp. In the photo above, ramps B and D have no transition to landing. Weight specifications: Some ramps are designed for manual wheelchairs, some for electric wheelchairs, some for unoccupied wheelchairs and others for occupied. Be sure to check the weight specifications of the ramp to make sure that you are covered. Too often, people buy inexpensive wheelchair ramps, only to find out that they were designed for unoccupied wheelchairs. Handrails: If the wheelchair ramp will be only used by one person, that person can decide if they are likely to need handrails. But if the ramp is for the general public, handrails are a must. Not everyone will be able to push themselves up a wheelchair ramp. Handrails which are reachable by both hands give wheelchair users the option to pull themselves up or to rest if they get tired or steady themselves if they feel insecure. The position of the handrails will also be very important, as pediatric users will usually have a lower seat height than adult users and two sets of handrails may be required for public ramps. Handrails made from wood need to be finished carefully to avoid splinters. Handrails for ramps are different than handrails for stairs, because stairway users generally require the handrails for balance while wheelchair users may use the handrail to pull themselves up. Therefore the risk and severity of injury from splinters is much, much greater. In the photo, ramps A and D have no handrails at all. Edge protection: Wheelchair ramps must have a raised edge on the side to keep people from falling off. Different users will require different heights, but by all means make sure the wheelchair ramp has a good sized edge protector. Ramp D is very steep and has no edge protection at all making this ramp particularly dangerous. The edge protection in ramp B is not high enough. Track Ramps Wheelchair Ramps A and B use tracks, one for each wheel. This assumes that every wheelchair has the same width which is not reality. Wheelchair width vary dramatically and a public ramp with tracks will only be helpful for some users. Track Ramps may be fine for personal use if you don't think your wheelchair width will change much, but they should not be used for public purposes. Materials: Aluminum is an excellent material because it is resistant to corrosion, strong as well as lightweight. But aluminum is expensive and very lightweight aluminum may be flexible and bend or wobble. Make sure that the aluminum ramp meets the requirements for the weight of the wheelchair with an occupant in it. Unfinished, untextured aluminum may be slippery when wet. It must have a textured finish or material that will grip tires well. In the photo above, ramp A is made of untextured aluminum, and as you can see it has been raining. This ramp will be very slippery and very dangerous. Steel is heavier than aluminum but also maybe less flexible, more secure and less expensive. However, unprotected steel can rust or corrode. Galvanized steel is chemically coated with zinc to keep it from corroding. A texturized surface is important to prevent slippage. Galvanized steel maybe less expensive than aluminum. But the zinc coating may wear off and when it does corrosion can result. Concrete with a rough textured surface is possibly the ideal material for a permanent wheelchair ramp, though very expensive. Find a volunteer organization to build a wheelchair ramp for you. - The ADA (Americans with Disabilities Act) has developed Accessibility Guidelines for wheelchair ramps used for public access, with clear specifications and requirements. Many US states have adopted International Residential Code which cover ramps for private residences. Frequently, you will be required to obtain a building permit before installing any kind of ramp. Check with your State Building Inspector. - Minnesota Ramp Project has developed a design manual with instructions on how to build a wheelchair ramp for your home. - Dallas Ramp Project has a step by step slide show demonstrating a home ramp being built. Contract a company to build the wheelchair ramp for you: If you can afford it, your best option maybe to have an experienced company build a wheelchair ramp for you. Do NOT use a contractor inexperienced in building wheelchair ramps for this tasks. Use only a builder experienced in working with disability projects and complying with ADA or local standards. Ask for references and check them. what happens if the modular wheelchair ramp does not work for your needs? Will you be able to return it? Will there be charges for shipping or repackaging? Do company brochures state that their ramps comply with all ADA (or local) requirements? If not, ask for this in writing. If you are unable to assemble it, will someone from the company be able to assemble it for you? Before installing a modular ramp, check with your building inspector or local authority to see if you need a permit. Funding: Some states provide funds to help modify homes of disabled people. Ask your local Center for Independent Living to see if they know of a funding source for which you may be eligible. Click here to find a database of Center's for Independent Living. As an example of state funding, click to see details of the program for Delaware. Platform Ramps: Usually large and flat allowing the chair to roll over a large surface area, these may be folding or non-folding. Track Ramps: Long and narrow, track ramps come in pairs, one for each side of the wheelchair. Track ramps may be one long unit or telescoping (composed of 2 or more units which slide inside each other like a telescope) or rollup (composed of multi-hinged units which fold into a compact roll). Degree of Incline: Wheelchair ramps for vans are often considerably steeper than ramps for houses in order to make it practical for parking as well as easier for the caregiver to handle. Many electric wheelchairs have enough power to climb steep ramps. Check your owners manual to determine the maximum gradient that the manufacturer recommends but always test various ramps to determine the maximum incline that is safe for you. However, never exceed the recommended gradient for your wheelchair. For doorway thresholds and other obstacles that are less than 3 inches (7.5 cm) high, the ADA guidelines allow ramp inclines of up to 1:8. For any height above 3 inches (7.5cm) the same recommendations hold as discussed for permanent ramps above. Weight capacity: Typically ramps should have a minimum carrying capacity of at least 550 lbs or 250 kg, but make sure that the ramp you buy has a minimum capacity exceeding the weight of your wheelchair plus your weight. Many ramps are designed ONLY for use in unoccupied wheelchairs! Be sure your ramp is designed to carry your wheelchair with you in it. Material: Portable ramps are generally made out of aluminum, but occasionally other material such as fiberglass is used. If you buy a ramp from material other than aluminum, make sure that like aluminum it is lightweight, strong and corrosion resistant. Connection to Vehicle: Some ramps attach permanently to the interior of the vehicle and fold out. Others connect to the lip of a sliding van door when open. Be sure that the connection offers a stable platform and flush transition from ramp to the vehicle’s interior. Track vs Platform Ramps: All wheelchair ramps should have edge protectors on the side so that the wheelchair does not fall off of the ramp, though many ramps do not. The edge protectors of track ramps make a ‘U’ shape that the wheels of the wheelchair fits into forming a ‘gutter’. If track ramps have gutters that are too narrow they may not allow the wheelchair casters (front wheel) to move freely and a caster may get stuck if a castor suddenly turns sharply. This can be very dangerous for the user, since if the caster gets stuck and the back wheels keep turning, the wheelchair can get thrown off of the ramp. The gutter should always be larger than the diameter of the caster and the edge protectors should be high enough to prevent the wheel from going over. In the drawing to the right the track is too small for this caster and this could be dangerous. Some track ramps have only one edge protector per track, with the one side open, in order to prevent the caster from getting stuck. These should only be used when the distance of the ramps are fixed and properly set otherwise there is a risk that the wheelchair could fall off of the ramp. A disadvantage of any track ramps is that unless one end of the track is fixed, for example, attached to the back of your van, it might be difficult to place the tracks in the correct position everytime. If you mistakenly place the tracks in the wrong position the wheelchair may drive off the side of the ramp. Caregivers often prefer track ramps above platform ramps because they are easier to handle and carry. Another advantage is that the caregiver can walk between the tracks in order to push or assist the wheelchair users. Wheelchair users usually prefer platform ramps because these require less effort and concentration when driving up or down. One piece platform ramps are more popular than folding ramps with electric wheelchair users as they feel more stable than folding to telescoping units. But due to the size, they may take up alot of room in the vehicle. Always check ramps for sharp edges or burrs as this can damage the wheelchair tires, or injure caregivers. Many inexpensive ramps can have a poor finish and these should be avoided. Folding ramps can pinch fingers. Use caution when opening and folding. Ramps should have a level end platform designed for easy transfer from ramp to the street. All wheelchair ramps should have edge protectors to prevent the user from falling off the side. There should also be a simple to use locking mechanism to prevent the ramp from moving when in use. Pay attention to the location of handles and locking mechanisms as this can make a big difference in the ease of handling for caregivers. "I would emphasize that when a caregiver is assisting a person in a wheelchair on a ramp they should always place themselves between the wheelchair and the bottom of the ramp - pushing it up and leading it down. That way if they lose control they are still in place on the downside of the slope protecting the person in the wheelchair." For those in the UK, consider this company which distributes UK wheelchair ramps. The content of this article is copyrighted. It may not be reproduced without permission of the owners of Wheelchair.